Artist Statement: "My work explores, often through fictional narrative, the real-world power structures and tensions that exist not only between different cultures and social classes, but also between humanity and the natural world. More specifically, I construct stories about people who have gained or lost power, people who have given their power willingly, and people who have had their power taken from them. Power exchanges infiltrate every conceivable realm of human activity; by isolating and – in an almost monastic sense – illuminating these exchanges, I am cataloging just a few of the innumerable threads in the undocumentably complex web of human interaction. "Because storytelling is so intrinsic to how people contextualize, experience, and even lay claim to the world, my work takes the form of narrative structures such as the artist book and the interactive installation. Through meticulous craftsmanship in the depiction of lush environments, opulent aristocracy, and fantastic animals, these works seduce the viewer into enjoying and appreciating imagined worlds imbued with real ugliness. My role, in the end, is that of the storyteller: to entice and engage, but also to investigate real-world power dynamics through a more inviting, fictional lens.."
Chicago, Illinois: Hannah Batsel, 2016. Edition of 125. 6.25 x 9.75"; 48 pages plus colophons for each book. Dos-a-dos structure. Combines screen, offset, and letterpress printing techniques, and includes 14 original reduction linoleum prints. The text, photographs, and scanned materials were offset printed at Columbia College Chicago. 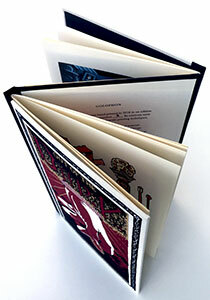 The linoleum-cut illustrations were letterpress printed at both Columbia College and Spudnik Press in Chicago. 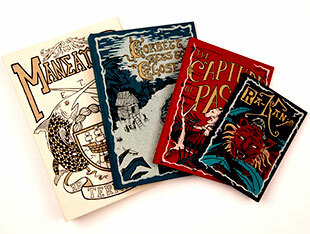 Bound in screen-printed cloth-covered boards, printed at Spudnik Press. This book was made possible by funding from The Caxton Club of Chicago and The Albert P. Weisman Award. Signed and numbered by the artist. 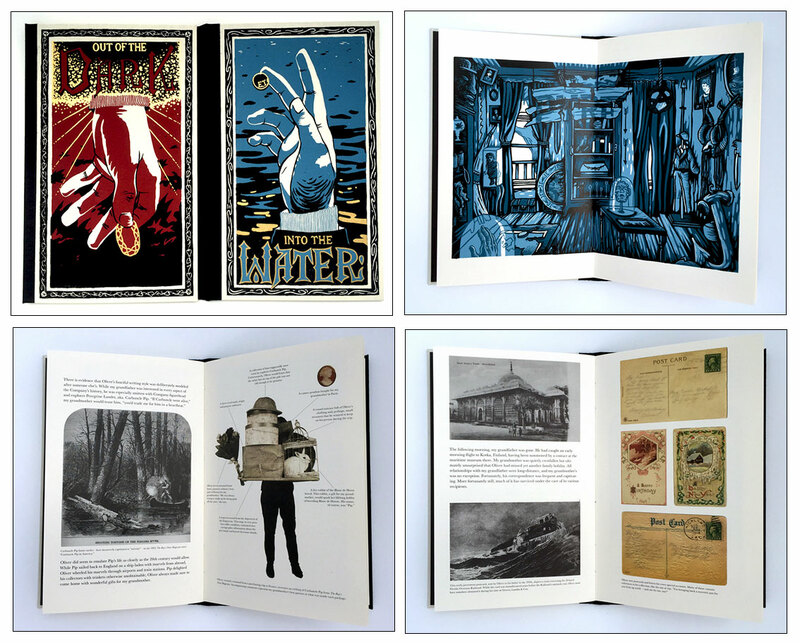 Hannah Batsel: "Out of the Dark/Into the Water is an edition of 125 hand-printed and hand-bound artist's books about the life and work of Oliver Robert Batsel, an American collector of exotic artifacts and art objects from around the world. Batsel spent his life gathering clothing, documents, jewelry, photographs, and other ephemera related to the Empyreal Trading Company (E.T.C. ), a small mercantile enterprise which operated from the 17th through the 19thcenturies. Batsel's obsession was undeterred by the constant loss and calamity that accompanied it until one final disaster ended his life and collection in an instant. "In 2004, after decades of amassing the most complete E.T.C. collection in the world, Hurricane Ivan leveled Batsel's beachside Florida home. The house, the collection, and Batsel himself were swept out to sea. Now, over a decade later, Batsel's granddaughter, Hannah, has begun to excavate the sand lot where the house once stood, recovering pieces of Batsel's story and restoring the artifacts to which he dedicated his life. "Out of the Dark/Into the Water is a dos-a-dos book, a historical binding in which two text blocks share a back cover. One half describes Hannah Batsel's memories of and relationship with her often-absent but endlessly fascinating grandfather. The other half takes a closer look at the collection itself and the progress that has been made towards restoring it. Together, they form a story part imagined and part remembered, but in the end, essentially true. " Gainesville, Florida: Hannah Batsel, 2017. Edition of 45. 6.25 x 8.75"; 20 pages plus 2 double-size fold-out pages. Includes three pages with pull tabs. Letterpress printed from linoleum reduction blocks by the artist and photopolymer plates by Boxcar Press. Printed on Murillo paper in ivory, red, and black. 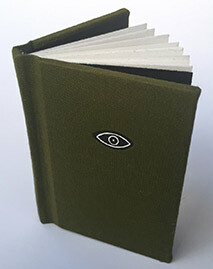 Bound in black bookcloth with paper medallion on front cover. Letterpress printed in the UF School of Art and Art History Type Shop. Co-produced by H. M. Batsel (Chicago, Illnois) and Ellen Knudson (Associate in Book Arts, University of Florida). Signed and numbered by the artists. 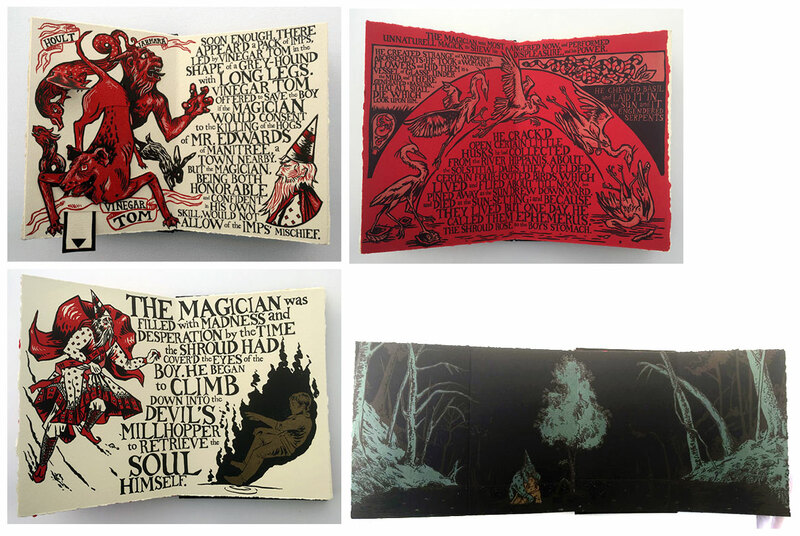 Hannah Batsel: "Ephemerus is the 2017 artist's book edition from the Marjorie S. Coffey Library Endowment Residency at the George A. Smathers Libraries at the University of Florida. The book was designed by H.M. Batsel during the semester-long residency in the fall of 2017. The book is inspired by Batsel's research and study of occult and magical texts from the Harold and Mary Jean Hanson Rare Book Collection in the Special and Area Studies Collections Department. "When the apprentice of a learned magician falls ill, the magician must push to (and beyond) the boundaries of his power to prevent the apprentice's soul from slipping into an inescapable sinkhole, the Devil's Millhopper. A dark fairytale about the limitations of human ability and the inherent impermanence of human life." Chicago, Illinois: Hannah Batsel, 2015. Edition of 50. Four nested books: 4 x 5.25", one opening; 5 x 6.75",6 pages; 5.75 x 8", 10 pages; 6.5 x 9.25, 14 pages. Screen printed. 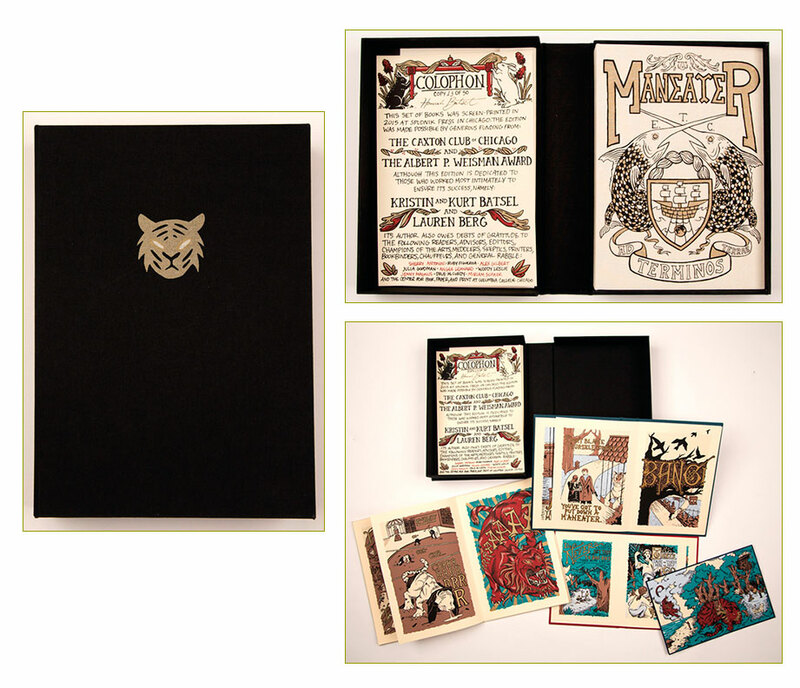 Housed in a 7 x 10 x 2" cloth-covered custom clamshell box with tiger illustration on lid and titles on spine. Colophon slipped in envelope pastedown to interior of box lid. Signed and numbered by the artist. Hannah Batsel: "The set consists of four stories whose physical and narrative structure nest within one another like Russian nesting dolls. The books can be read separately, but when taken together, reveal a legacy of greed and colonialism across generations. "Every time a new character’s name is spoken, a new book begins that follows that character’s life story. The first book’s protagonist is a wealthy shut-in who becomes obsessed with an exotic deity; the three enclosed books reveal this retired businessman’s colonialist past and the history of the deity’s native land. With every book, the narrative as a whole moves backwards chronologically in time. The visual style echoes that of 19th-century children's mass-market hardcover adventure books, whose bright and captivating illustrations belied the troubling imperialist messages conveyed within. "Magnets embedded in the spine of each book hold them in place for display or easy reading as a set. " [Chicago]: Hannah Batsel, 2018. Edition of 3 + 2 AP. 2.75 x 3.5"; 8 leaves. Linoleum prints. Bound in green cloth. Signed and numbered by the artist. 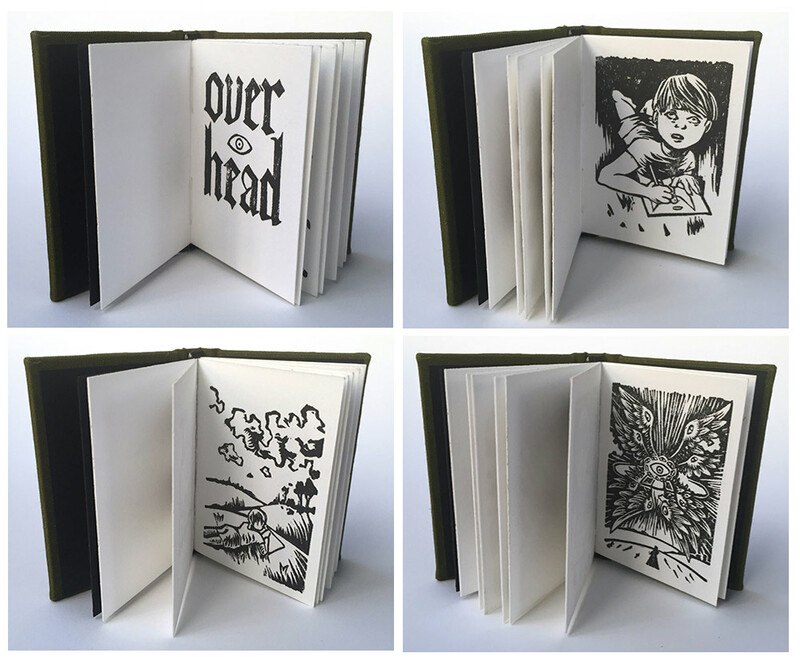 Hannah Batsel: "Overhead is a small linoleum-printed artist book that was designed, carved, printed, and bound in 24 hours on a series of commercial airline flights in May of 2018 as part of Air Air Residency. The book's six unique linoleum block prints tell the story of a young boy who, while drawing an angel, meets a much more biblically-accurate version of his subject. 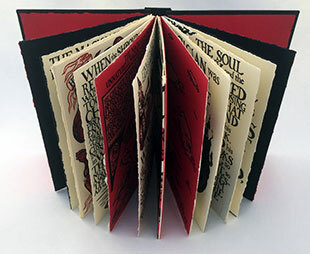 The book's concept and sketches were completed on a flight from Chicago to Indianapolis; the block carving took place during that layover in Indianapolis, a flight from Indianapolis to New York, and a layover in New York; the printing took place during a flight from New York to Miami; the inset covers and binding were completed using a specially-made TSA-approved 7" nipping press during the Miami layover and on a flight from Miami to Atlanta." "I arrived to the Chicago O’Hare airport around 5:30 AM and immediately asked the man sitting next to me for a prompt - he said 'aloft,' which led to this little book about meeting a real angel, whirling eyeballs and all."